No. 15 Lions look to avenge loss with a rematch at No. 6 Tarleton in the regional semifinal. COMMERCE – The No. 15 Texas A&M University-Commerce football team is in its third consecutive NCAA Division II Regional Semifinal and face a rematch from the regular season, traveling to Stephenville to take on Lone Star Conference rival No. 6 Tarleton on Thanksgiving weekend. RECORDS: The Lions are 10-2 overall and went 6-1 in the Lone Star Conference. The Texans are 11-0 overall and went 8-0 in the LSC, winning the conference championship. RANKINGS: Texas A&M-Commerce is ranked No. 15 in the AFCA Coaches’ Poll and No. 18 in the D2Football.com Media Poll. Tarleton is ranked No. 6 in the AFCA Coaches’ Poll and No. 5 in the D2Football.com Media Poll. • The Lions have also advanced to the regional semifinal round for the third consecutive season. Ferris State has reached the regional semifinal four times in a row. • This is the Lions’ seventh all-time NCAA Playoff berth, with a 9-5 record. • Today’s game also marks the Lions’ 25th all-time postseason contest, with A&M-Commerce carrying a record of 16-7-1. • The Lions are 15-12 all-time in the trophy game, with an 8-5 record in Stephenville. • The Lions had won six matchups against the Texans in a row before Tarleton’s 47-21 win in Commerce in October. • A&M-Commerce has not lost in Stephenville since 2011, marking a three-game win streak in Erath County. 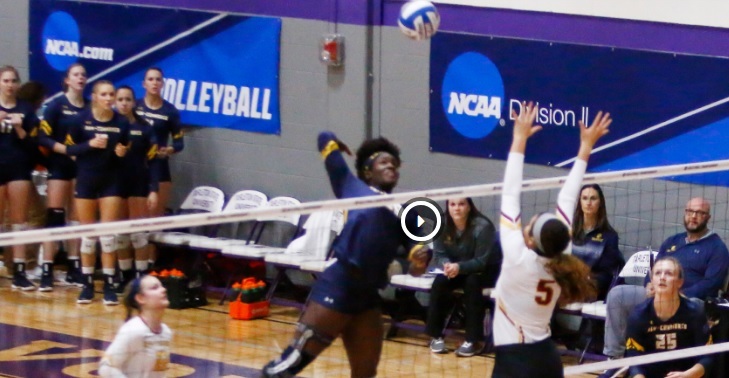 • This is Lion Athletics’ third straight weekend of playoff action in Stephenville, as the volleyball team won the Lone Star Conference Tournament, then advanced to the NCAA Division II South Central Regional final. • Also of note, the Lion Volleyball team as many matches in Stephenville this season as the did in Commerce, playing 11 games in both locales. • Head coach Colby Carthel now ranks fifth in A&M-Commerce history in coaching wins with 59 wins. • He is now only four wins behind Lion and LSC legend J.V. Sikes, who sits in fourth place with 63 wins. • He was named the Lone Star Conference Coach of the Year in the postseason awards. • The 2018 senior class has now claimed sole possession of the school record for wins in a four-year period with 43 games won in a four-year span. • A&M-Commerce has been ranked in 51 consecutive AFCA polls, dating back to the 2015 preseason poll. • This is A&M-Commerce’s 57th all-time appearance in the AFCA poll since its inception in 2000. • In the polls recognized by Division II as the top rating system, the Lions have been identified as a nationally ranked team 106 times since joining Division II in 1981. • Kicker Kristov Martinez scored nine kicking points with two field goals and three PATs in the win over Angelo State. • He was named the 2018 Lone Star Conference Academic Player of the Year, as well as first team all-LSC. • The graduate student from Edinburg is now 16-for-21 on field goal attempts and 47-for-47 on PAT attempts in 2018. • He is the Division II active career leader in field goals (70), which ranks second in Division II history. He has made 13 consecutive field goals in the postseason. • He is the Division II active career leader in PATs (223), which is the third most in all divisions. • Has made 102 consecutive PATs, dating to the third week of the 2017 season. • He is the Division II active career leader in points (433) and needs five points in the second round of playoffs to become Division II’s all-time career kick scorer. • A&M-Commerce leads Division II in kickoff return coverage, allowing only 10.86 yards per return on 35 returns, while also booting 27 touchbacks. Lions have led the nation in kickoff return coverage in each of the last two seasons and placed second the year prior. • Regarding overall scoring, Martinez (433 points) is chasing West Texas A&M’s Sergio Castillo (437 points) and has passed former Harlon Hill winner at Texas A&I Johnny Bailey (426 points) for the all-time LSC scoring record. • The Lions’ leading tackler in senior Brucks Saathoff is also one of the leaders in the Lone Star Conference. • The San Antonio native is averaging 7.3 tackles per game through 11 contests, ranking 162nd nationally and 13th in the LSC. • For his career, Saathoff has 296 tackles, which is the leading mark for the Lions. • This ranks Saathoff in the top five in Lion history in tackles. • Lion wide receiver Marquis Wimberly earned first-team all-Lone Star Conference honors. • He did the honor after catching 50 passes for 674 yards and seven touchdowns in 10 games of the regular season of his senior campaign. • He ranked sixth in the league in receiving yardage and third in receiving touchdowns. • Wimberly added three receptions for 49 yards in the Minnesota Duluth game, including a critical 40-yard touchdown reception in the early part of the third quarter. • Lion tackle Amon Simon earned first-team all-Lone Star Conference honors. • Simon earns all-LSC honors for the first time in his career. • He started in every game for the Lions as a redshirt sophomore, establishing himself as one of the league’s top young talents and most dominant linemen. • Lion defensive end Michael Onuoha earned first-team all-Lone Star Conference honors. • Onuoha wins first-team all-LSC honors for the second consecutive season. • In his senior campaign, he has made 42 tackles with 14.0 tackles for loss, 6.5 sacks, an interception with a 48-yard return, and two blocked kicks. • He ranks fourth in the LSC in sacks and fifth in the LSC in tackles for loss. • The Lion kicking game has been spectacular during the 2018 season. • A&M-Commerce ranks first nationally in kickoff return defense, as Lion opponents average 10.86 yards per return. • A&M-Commerce ranks No. 34 nationally in net punting. The Lions average 36.23 yards net per punt. • Tristan Perry averages 39.3 yards per punt, which is fourth in the Lone Star Conference and ranks 60th nationally. • Lion defensive back Dominique Ramsey earned first-team all-Lone Star Conference honors at safety, then put forth another impressive performance in the regional quarterfinal. • The all-LSC honor is Ramsey’s first postseason honor. • In the Minnesota Duluth game, the redshirt sophomore returned a punt 79 yards for a touchdown, breaking eight tackles in the process for his second punt return touchdown and fourth overall return touchdown of the season. • In the regular season finale, he had a 99-yard interception return for a touchdown in the third quarter of the win over Angelo State. • Ramsey has three interceptions for 226 return yards, averaging 75.3 yards per INT return. This does not include an interception on a two-point conversion attempt in the A&M-Kingsville game, which the NCAA statistics policy does not count as an interception. • Ramsey’s interception return yardage leads the nation. • The Lions has a team average 42.7 yards per interception return on nine picks. • Of the 10 interceptions, four have been returned for touchdowns. • On top of this, Ramsey ranks 17th nationally and first in the LSC in punt return average, averaging 12.8 yards per punt return. • He has nine plays of over 20 yards this season – five punt returns, three interception returns, and a kickoff return. Four of those plays went for touchdowns. • His six career interceptions are the most on the team. • The Lions held UT Permian Basin to minus-69 rushing yards last week to establish a program single-game record for rush defense. • The previous record of minus-48 yards was set against Angelo State in 1992. • The Lone Star Conference record of minus-77 yards was set by McMurry against Abilene Christian in 1968. • A&M-Commerce had nine sacks and held UTPB running backs to zero cumulative rushing yards. The Falcons did not have a rushing first down. • This is the second-fewest rushing yards allowed in a Division II game in the last six seasons. Limestone allowed minus-79 rushing yards against Shaw in 2016. In all four divisions of NCAA football this season, the Lions have the best single game rushing defense performance. • The Lions scored 34 points in the second quarter of the game at Western New Mexico, establishing a school record for points in a quarter. • The previous record was 32, which the Lions scored in the second quarter of a 39-39 tie against Angelo State in 1991. • The win over Minnesota Duluth gave the Lions three straight 10-win seasons for the first time in program history. • Lion return specialist Reggie Kincade earned first-team all-Lone Star Conference honors. • Kincade established himself as one of the top return threats in the nation and wins his first all-conference honor. • He ranks first in the LSC and second nationally in kickoff return average at 38.7 yards per return during the regular season. • He has two kickoff returns for touchdowns this season. • He was also previously a track All-American on the Lions’ outdoor 4×100-meter relay team. • This is not just a Willie Nelson reference for coach Carthel, even though he will appreciate it. • The 2018 Lions are 6-0 on the road. • The 2018 season is the eighth time in program history that the Lions have won five or more true road games, including an 8-1 record away from Commerce in the 2017 National Championship season and a six-win road season in 2016. • The Lions also had six road wins in 1951, 1953, and 1980. The Lions had five road wins in 1957 and 1990. Each of those seasons except 1951 concluded with a postseason appearance. • The Lions have seen the same opponent twice in the same season four times total. • The most recent was the two years of the Lone Star Conference Playoff in 2014 and 2015, going 2-2 in those games. 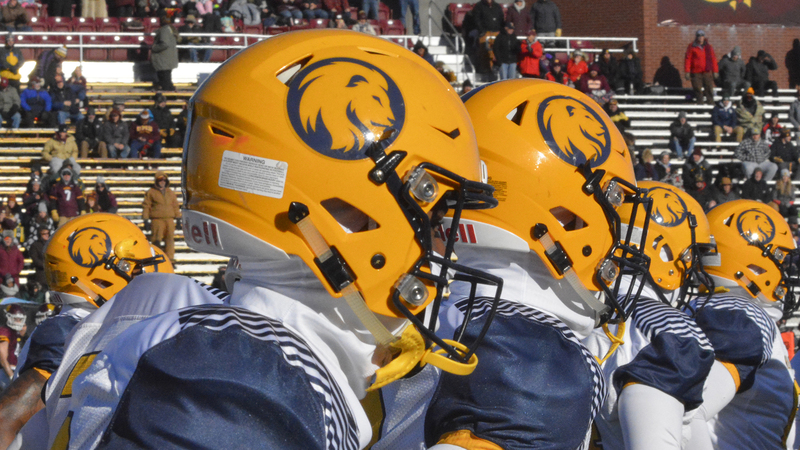 • The Lions won each LSC Semifinal, beating Tarleton 56-49 in the 2014 semifinal. • Before that, there were two World Wars between occasions in which the Lions saw the same team twice. • In the first season of ET football in 1914, the Lions won two games against Commerce High School. • In year two of Lion football in 1915, ET split the only two games of the season’s schedule with the now-defunct Burleson College of Greenville. • In those two seasons, the point after a touchdown had not been introduced to college football, as that would be instigated in 1922. Nov 7, 2018 at Minnesota-Duluth W 33-17 DII Regional Qtr Duluth, Minn.
• The Lions are 5-3 in overtime games all-time. • 1928 – East Texas drops the season finale at McMurry, 42-13. • 1951 – The Lions make the short trip to Sherman and take down Austin College, 12-7. • 1955 – ET picks up a win in Alpine in the season finale, shutting out Sul Ross, 14-0. • 1956 – The Lions end the campaign with a 45-6 rout of Sul Ross at home. • 1990 – In their first NCAA Division II Playoff appearance, ET advances to the National Quarterfinal, falling to Pittsburg State, 60-28, at Carnie Smith Stadium in Kansas. Gary Compton recovered a Jarrod Evans fumble for the Lions’ first touchdown before the Gorillas rattled off 32 straight points. Compton caught a 20-yard pass, but ET trailed 39-14 at the half. Compton and Owens scored in the third quarter to cut the lead to 11 points before PSU scored 21 in the fourth to close the game. The Lions had forced a record number of turnovers prior to the game, but then turned the ball over eight times to Pitt State, and forced only one. Shelley Chapron named First Team All-Region by AVCA. 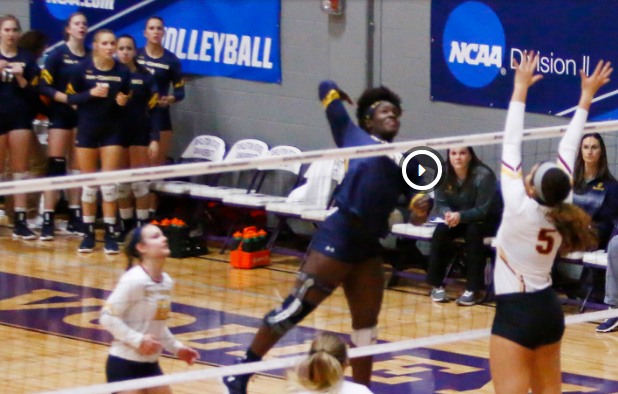 COMMERCE– Texas A&M University-Commerce middle blocker Shelley Chapron has been named to the American Volleyball Coaches’ Association All-South Central Region team. The team was announced Wednesday by the AVCA. Chapron– a junior from Houston (St. Pius X)– had a spectacular season for the Lions, earning First Team All-LSC honors. She was named the Lone Star Conference Tournament MVP and helped lead the Lions to their first conference tournament championship in more than 30 years. She finished the season hitting .374 and led the LSC in hitting percentage throughout the season. She led the team with 361 kills and also had 133 blocks and 15 aces. Chapron was also named AVCA National Player of the Week this season. The 2017 LSC Newcomer of the Year, this is the second consecutive season Chapron has been named to the AVCA All-Region teams. She is now eligible for All-American status. The Lion Volleyball team had its most successful season in more than 30 years. The team won 30 games for the first time since 1987, finishing with a .833 winning percentage. The team earned the second seed in the South Central Region, making its second consecutive appearance in the NCAA Tournament after receiving an automatic berth after winning the program’s second-ever LSC Tournament championship. The team advanced to the NCAA Regional Championship match. The Lions were 23-2 in their final 25 games of the year. Madison Brabham Texas A&M – Kingsville RS Sr.
Shelley Chapron Texas A&M – Commerce MB Jr.
Adriana Darthuy Tarleton State OH Jr.
Taylor Duryea Metropolitan State OH Sr.
Audrey Fragniere Angelo State OH Sr.
Kasie Gilfert Colorado Mesa MB RS-So. Nikki Kennedy Regis MB Jr.
Hannah McManus Tarleton State MB Sr.
Kate Ranes Texas Woman’s S Jr.
Debra Rogers Arkansas – Ft. Smith MB Sr.
Camille Smith Colorado Mesa MB Jr.
Drew Stokes Colorado School of Mines S Fr. Santaisha Sturges Metropolitan State OH Sr.
Megan Treanor Dixie State RS So. Lauren Gammell Dixie State MB Jr.
Abby Tiesman Colorado School of Mines MB Jr.
Selena Batiste West Texas A&M S/RS Jr.
Meghan Parker Angelo State S Jr.
Bailey French Texas Woman’s L Jr.
Adrianna Knutson Tarleton State L Sr. Cold shooting night hampers Lions against St. Mary’s in 62-51 loss. 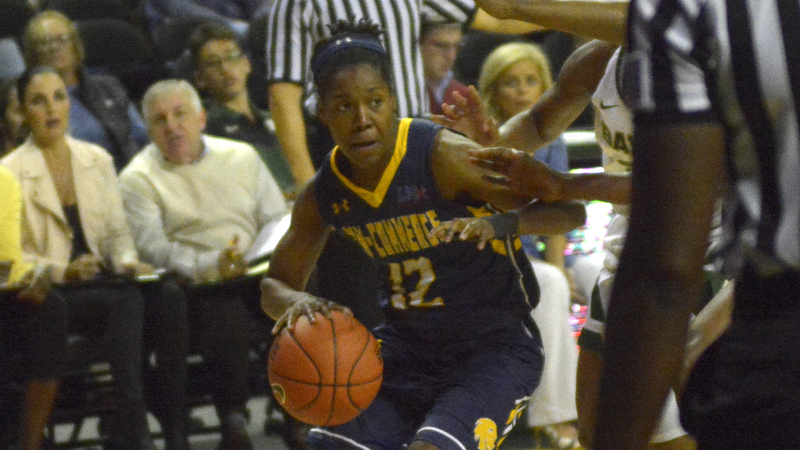 COMMERCE– The Texas A&M University-Commerce women’s basketball team lost to St. Mary’s 62-51 on Tuesday night. The Lions played a close first half but could not overcome a strong third quarter from the Rattlers. The loss brings the Lions to 2-3 on the season while St. Mary’s improves to 5-1 on the year. 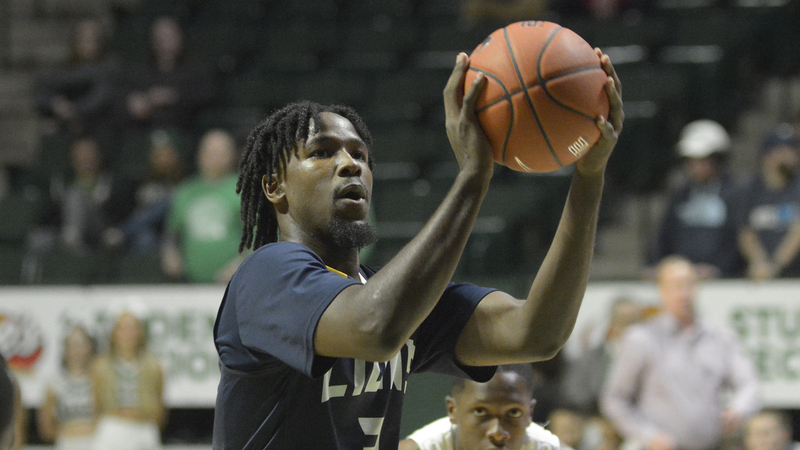 The Lions return to the court on Sunday for a road game against Southeastern Oklahoma State. The game will be played at 2:00 p.m. at Bloomer Sullivan Arena in Durant, Okla.
– Chania Wright (DeSoto) led the Lions with 13 points and also pulled in five rebounds. – Ekaterina Zhibareva (Liske, Russia) had eight points and five boards while Princess Davis (Shreveport, La.) added seven points and a team-high three assists. – Mykiel Burleson (Pflugerville) had six points and led the team with six rebounds while Alexis Bryant (Pflugerville) had seven points and five boards. – The Lions shot 29 percent in the game, including 22 percent in the first half. St. Mary’s shot 42 percent in the contest. – While A&M-Commerce won the turnover battle 19-to-16, they lost the points off turnovers battle 22-to-11. – There were one tie and four lead changes in the game. The Lions never led by more than one point in the game and never led after the second quarter. The Rattlers got off to a quick start, netting the first eight points of the game. The Lions missed their first four shots of the game. Davis got the Lions on the board with six minutes left in the quarter. After a three from St. Mary’s brought its lead to nine, the Lions fought back to cut the lead to three, including two jumpers in the paint from Bryant. The teams traded field goals, and the Lions went into the second quarter trailing 15-12. The Lions tied the game at 15 early in the second quarter and took their first lead of the game on a three from Wright. The edge traded hands twice more before the Rattlers ended the half with two threes. St. Mary takes a 25-21 lead into halftime. St. Mary’s was held to just 27 percent shooting in the quarter, but the Lions shot 20 percent. Bryant led the team with six points in the half while Davis had five. The Lions fought to begin the second half but could not overtake the Rattler lead. The teams traded field goals through the first seven minutes of the quarter before St. Mary’s went on a 9-0 run to push their lead to double digits. The Lions went into the fourth quarter trailing 43-32. A three from Wright to open the quarter cut the Rattler lead to single digits but St. Mary’s quickly pounced again, pushing their lead once again to double figures, a point the Lions could not seem to chip into. The closest the Lions could get was an eight-point deficit in the final seconds. Princess Davis named LSC Defensive Player of the Week. 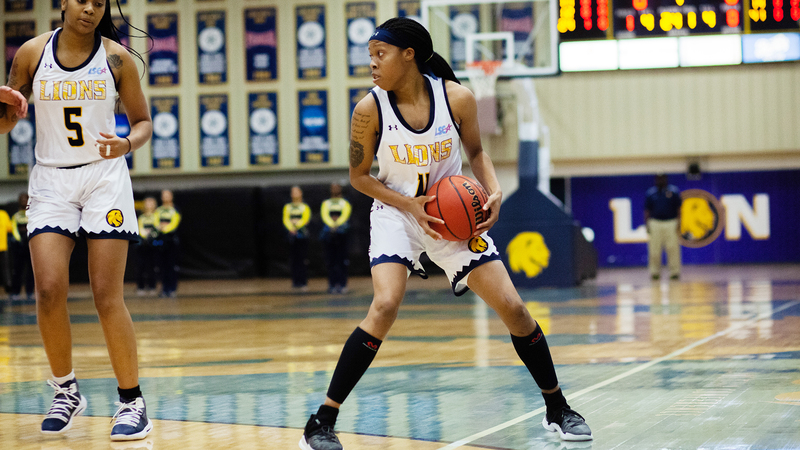 RICHARDSON– Texas A&M University-Commerce point guard Princess Davis has been named the Lone Star Conference Defensive Player of the Week. The award was announced by the conference office on Tuesday. Davis– a redshirt senior from Shreveport, La.– was a pickpocket for the Lions, recording six steals in the team’s overtime win over St. Edward’s on Friday. She was clutch down the stretch for the Lions, snatching two steals in the overtime period and making all four of her free throws to close out the game and keep the Lions ahead in OT. She scored 16 points overall in the contest, including 10 free throws and had four assists. In the game, Davis became the 13th player in program history to reach 1,000 career points. Davis also moved into second place in program history in assists, fourth in free throws, fourth in career minutes played and ninth in career steals, all in the same game. Davis and the Lions return to action on Tuesday against St. Mary’s. The game will be played at 6 p.m. at The Field House in Commerce. Men finish 19th, women 29th at NCAA South Central Regional. 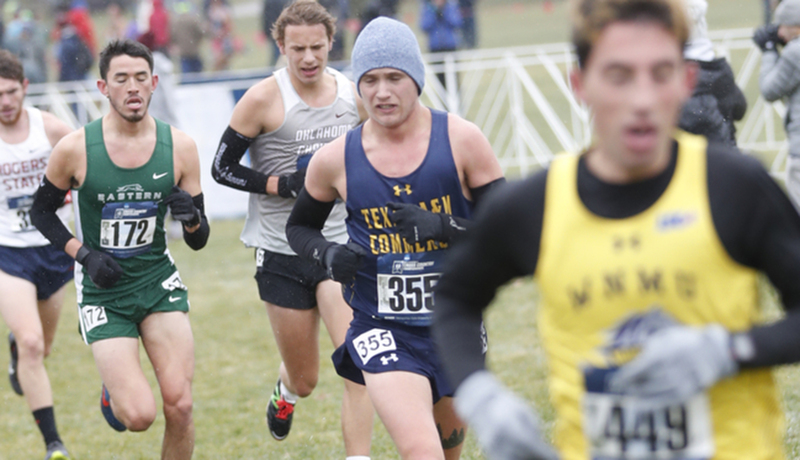 DENVER– The Texas A&M University-Commerce cross country teams competed at the NCAA South Central Regional races on Saturday. The Lion men finished 19th as a team in the 10K race while the Lion women finished 29th in the 6K. The Lion men scored 567 points, led by senior Evan Luecke (Forney), who finished 70th with a time of 33:18.4. Mason Boswell (Katy) placed 100th with a time of 34:12.6, Sergio Marcuello (Cuenca, Spain) finished 129th with a time of 35:04.5, Garvin Chilton (Katy) finished 142nd, Edwin Aparicio (Katy – Cypress Springs) finished 143rd, Sage Breed (Dallas – Sachse) finished 146th, and Steeven Martinez (Mesquite – Poteet) finished 157th. The Lion women scored 769 points, led by junior Brandi Stalder (Sanger), who finished 60th with a time of 23:50.1. Mikayla Maldonado (Dallas – Nimitz) finished 172nd, Shelby White (Eustace) finished 181st, Maiya Collins (Rockwall) finished 184th, Maddie Shubert (Rowlett) finished 188th, Taylor Jones (Garland – North Garland) finished 200th, and Mallory Morgan (Katy) finished 202nd. Lions use the second-half run to put away Western State Colorado 84-76. GUNNISON, Colo.– The Texas A&M University-Commerce men’s basketball team defeated Western State Colorado 84-76 on Saturday. The Lions never trailed in the second half, leading by as many as 17. The win brings the Lions to 4-1 on the season while the Mountaineers fall to 1-3 on the year. The Lions will return to action on Friday when they travel to Denver, Colo. to face Regis. The game will be played at the Regis Fieldhouse at 7 p.m. MST. The Lions will then meet Metro State on Saturday at 5:00 p.m. MST. – Reggie Reid (Harlem, Ga.) led the team with 23 points, shooting 9-of-14 from the field. He also had five rebounds and led the team with four assists. – Willie Rooks (Houston – North Forest) had 16 points, making four threes in the contest. Trey Conrod (Kilgore) added 13 points, including nine from the free throw line. – Rodney Brown (Beaumont – West Brook) had 12 points and led the team with seven rebounds. – Austin Grandstaff (Rockwall) and Carson Tuttle (Mukilteo, Wash.) both had seven points. – The Lions shot 48 percent from the field, including eight three-pointers. The Lions got to the foul line 36 times in the game. The Mountaineers scored the first five points of the game before a three from Rooks started the scoring for the Lions. The teams traded buckets for the next 10 minutes as the score was tied at 19 midway through the half. The lead changed hands four times before back-to-back buckets from A&M-Commerce gave them the lead for good. A basket from Reid was followed by a three-pointer from Reid, and the Lions built a seven-point lead with four minutes remaining in half. The Lions pushed their lead to nine before the Mountaineers cut the lead to three with two minutes left. The Lions went into halftime leading 39-34. The Lions scored the first four points of the second half as they pushed their lead back to nine points. After a two-minute scoring drought from both teams, Grandstaff then made a jumper to give the Lions a double-digit lead. The Lions pushed their lead to 15 after two dunks from Brown. The Mountaineers began to climb back into the game at the midway mark, cutting the Lions lead to just five points with seven minutes to play. The Lions responded with a 12-0 run to bring their lead to 17 points with four and a half minutes left. Reid made three jumpers in the rally. A couple of threes from the Mountaineers cut the Lion lead to just six points with less than 30 seconds left, but the Lions held onto the lead and went with the eight-point win. No. 20 Lions win five-set thriller against Colorado Mesa to advance to Regional Final. STEPHENVILLE– The No. 20 Texas A&M University-Commerce volleyball team lost 3-1 to No. 13 Tarleton State in the NCAA Division II South Central Regional championship match on Saturday. The set scores were 21-25, 25-23, 16-25 and 26-28. The loss brings the Lions to 30-6 on the season, ending the most successful season in the last 30 years. TSU improves to 32-4, and they advance to the NCAA Championship tournament. The Lions won 30 matches for the first time since the 1987 season and won the Lone Star Conference Tournament Championship, also the first time since the 1987 season. – Jaslyn Wacker (Austin – Vista Ridge) led the team with 11 kills in the match, hitting .259. – Celeste Vela (Guadalajara, Mexico) finished with 10 kills, 21 assists, and seven digs. – Bina Njikam (Keller) also had 10 kills and led the team with five blocks. Madison Luther (Sealy) also had 10 kills. – Savannah Rutledge (The Woodlands – College Park) led the team with 29 digs while Riley Davidson (Commerce) had 15. Jaryn Wacker (Austin – Vista Ridge) had seven kills and 10 digs. – Rylie Fuentes (Robinson) led the team with 24 assists. The TexAnns took the first five points of the match before the Lions settled in, tying the game at eight. The TexAnns again built a lead before the Lions began to run. Chapron had two kills as the Lions scored six in a row to take a 19-17 lead. TSU battled back to retake the lead. The set fell the way of TSU 25-21. The Lions started out the second set strong, scoring four of the first six points. The Lions ran their lead to 11-5 early in the game. TSU began to battle back, scoring five points in a row to cut the Lion lead to one. The Lions then rallied one more time, taking six of the next seven points to build their lead to 19-13. TSU tried to rally late, but a swing from Njikam ended the set with a score of 25-23 in favor of A&M-Commerce. TSU took the first four points of the third set and built a 10-3 lead. TSU made its lead to eight before the Lions started to rally back. A&M-Commerce scored six points in a row to cut the lead to just two points. The TexAnns answered back with a 7-0 run to build their lead to nine. A&M-Commerce could not break the momentum and fell 25-16. It was a set of runs early for both squads in the fourth set. The Lions went on a 5-0 run, and it was then matched by TSU. TSU then went on a run to take the lead before A&M-Commerce tied the match at 22. The Lions had three opportunities to extend the game with set-point, but TSU would not quit and made the final set 28-26. Defense and special teams propel Lions to 33-17 win at Minnesota Duluth in the regional quarterfinal. 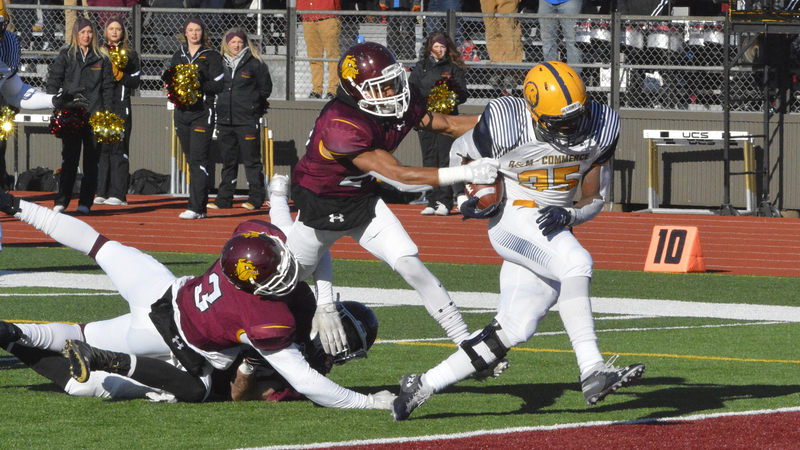 DULUTH, Minn. – A stout defensive performance and special teams fireworks led the Texas A&M University-Commerce football team to a 33-17 win over the University of Minnesota Duluth in the regional quarterfinal round of the NCAA Division II Playoffs on Saturday at Malosky Stadium. The Lions move on to the regional semifinal round with the win and run their overall record to 10-2 as the sixth seed in Super Region Four. Second-seeded UMD ends its season at 11-1. A&M-Commerce will take on Lone Star Conference rival and second-seeded Tarleton in the regional semifinals on Saturday, November 24, in Stephenville. – The win is the Lions’ sixth consecutive playoff victory. – The Lions advance to the regional semifinal round for the third consecutive season. – A&M-Commerce’s defense limited the Bulldogs to 188 total yards and 13 first downs in the game. The Bulldog offense only scored three points. This is the second consecutive regional quarterfinal in which the Lions did not allow an offensive touchdown. UMD entered the game averaging 470.4 yards of offense. – Garrett Blubaugh (Keller) led the Lions with 10 tackles, 2.0 sacks, and 2.5 tackles for loss. Deionte Haywood (Costa Mesa, Calif.) had eight tackles, 2.0 tackles for loss, 1.5 sacks, and a forced fumble which was recovered by Brandon Bascue (Flower Mound). – Chris Smith (Mansfield – Legacy) and Felipe Chambers (Fair Oaks, Calif.) each blocked punts. – The Lions scored two touchdowns on UMD punts. Dominique Ramsey (Converse – Judson) returned a punt 79 yards for a touchdown just before halftime, and Dayne Douglass (Canyon) returned a blocked punt 20 yards for a score in the fourth. – The TAMUC defense sacked Bulldog quarterbacks five times, while the Lion offense allowed none. – Ovie Urevbu (Plano – Legacy Christian) was the Lions’ leading rusher, carrying the ball 27 times for 65 yards and a 15-yard touchdown in the first quarter. The touchdown was the first time the Bulldogs allowed a touchdown in the first quarter this season. – Kane Wilson (New Orleans, La.) completed 14-of-31 passes for 213 yards and a touchdown. His two interceptions were returned for scores by the Bulldogs. – Ryan Stokes (St. Louis, Mo.) had five receptions for 100 yards, and Marquis Wimberly (Duarte, Calif.) had three catches for 49 yards, including a 40-yard touchdown in the third quarter. – Kristov Martinez (Edinburg) made field goals of 25 and 43 yards. Along with 3-for-3 on PAT kicks, Martinez scored nine points and moved his career scoring total to 433 points. He needs five points in the regional semifinal to become the Lone Star Conference’s all-time leading scorer. Martinez has made 70 career field goals, becoming the second player in Division II history to hit that mark. He has also made 102 consecutive PATs. The Lion defense started off hot, sacking the UMD quarterback on the game’s second play and forcing a 12-yard punt. The short field led to the opening score, as Urevbu scampered to the end zone from 15 yards out to give A&M-Commerce a 7-0 lead with 10:39 left in the first quarter. On the Lions’ next drive, the blue and gold drove to the UMD 23 and had a chance at a field goal, but a poor snap gave the ball back to the Bulldogs. A touchdown pass was wiped off the board after an offensive pass interference penalty. After a three-and-out, Smith blocked the Bulldog punt, and the Lions started near midfield. A 38-yard pass from Wilson to Stokes got the Lions to the red zone, but A&M-Commerce would have to settle for a 25-yard Martinez field goal. The kick gave the Lions a 10-0 edge with 2:02 left in the first quarter. The Lion defense kept the momentum rolling into the second quarter, as they snuffed out a fake punt attempt. A&M-Commerce was driving downfield when the Bulldogs made their first big play. Gus Wedig snagged a Wilson screen pass and returned it 80 yards for a UMD score, making it 10-7 with 12:15 left in half. The teams traded punts, then Minnesota Duluth’s defense struck again, as Nate Pearson intercepted a pass and returned it 29 yards for a score. The scoreline flipped to 14-10 in the Bulldogs’ favor with 8:01 left in half. The punters got plenty of work over the remainder of the half. On UMD’s third punt of the series of kicks, Ramsey fielded the ball at the A&M-Commerce 21 and eluded numerous tacklers on the way to a 79-yard punt return touchdown. His second punt return touchdown and fourth overall return touchdown of the season made it a 17-10 Lion lead at halftime. A&M-Commerce extended its lead to two scores on the opening drive of the second half. Wilson went over the top to Wimberly for a 40-yard score on the sixth play of the drive to make it 24-14 with 12:23 left in the quarter. After the sides traded punts for the rest of the third quarter, UMD scored its only offensive points of the day in the early stages of the fourth quarter. Dan Branger hit a 32-yard field goal to cut the lead to 24-17 with 12:56 left in the game. On the Bulldogs’ next drive, sacks by DD Fletcher (Arlington – Martin) and Blubaugh set up a fourth down. Chambers blocked the punt and Douglass scooped it up at the 20, then returned the ball to the end zone to push the Lion lead to 30-17 with 7:05 remaining. Mark Westbrook (Schertz – Clemens) intercepted a pass in Bulldog territory, setting up Martinez’ 43-yard field goal and making it a 33-17 game with 4:20 to play. The Bulldogs were within two scores on each of their final two drives, but Haywood’s strip sack and a fourth-down stop by Westbrook kept the Bulldogs off the board and gave the Lions their sixth straight playoff win. Hot-shooting Colorado Mesa downs Lions. GUNNISON, Colo. – The Texas A&M University-Commerce men’s basketball team fell behind early and was unable to recover in a 102-83 loss to Colorado Mesa University on Friday evening. The game was the Lions’ first of two in the Comfort Inn Classic at Western State Colorado University. The Lions fall to 3-1 on the season while the Mavericks are now 2-1 on the year. A&M-Commerce will next play Western State Colorado at 7:00 p.m. MST (8:00 p.m. CST) on Saturday. – The Lions shot 43.9 percent (29-of-66) from the floor and made 11-of-36 (30.6 percent) of their three-point attempts. CMU shot 56.9 percent (33-of-58) from the floor and made 11-of-25 (44.0 percent) of its three-pointers. – Trey Conrod (Kilgore) was the Lions’ leading scorer with 18 points and five rebounds. – Reggie Reid (Harlem, Ga.) scored 17 points, passed out a team-high four assists, and had four rebounds. – Austin Grandstaff (Rockwall) made his A&M-Commerce debut and scored 16 points off of the bench. Willie Rooks (Houston – North Forest) scored 10 points and had a team-best six rebounds. Reid scored on the game’s first possession to give the Lions an early lead, and A&M-Commerce was up 4-3 before the Mavericks went on a 17-point run. The Lions were held scoreless for 4:10 with three missed three-pointers and three turnovers before a Grandstaff triple stopped the skid at 20-7. A&M-Commerce trailed by 13 points with 12 minutes to play, then Colorado Mesa went on another eight-point run, and the Lions trailed by 21. Rooks’ layup with just under seven minutes to play cut the deficit to 13 points again at 34-21. The Mavericks continued their hot shooting the remainder of the period and took a 55-32 lead into halftime. The lead quickly ballooned to 27 points for CMU out of the break, but the Lions did not pack up and leave. A&M-Commerce cut the lead to 18 at 66-58 on Rooks’ three-pointer with 14:34 left. Srdan Budimir (Kadjorjevo, Serbia) hit a trey with 12:30 to play to narrow the lead to 17 points, and Carson Tuttle’s (Mukilteo, Wash.) triple with 11:26 to go cut the deficit to 14 at 71-58. Unfortunately for the Lions, that was as close as they would get. CMU would extend the lead to as many as 28 down the stretch, though A&M-Commerce managed to cut it to 17 in the late stages. 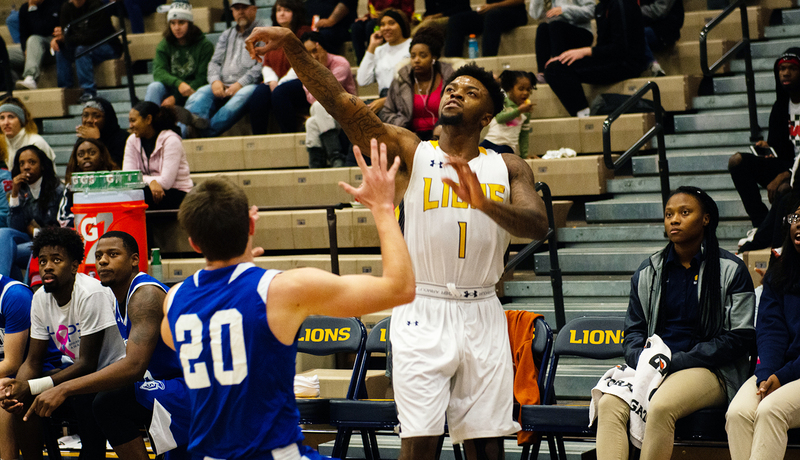 Davis scores 1,000th career point as Lions hold on for 86-79 OT win over St. Edward’s. 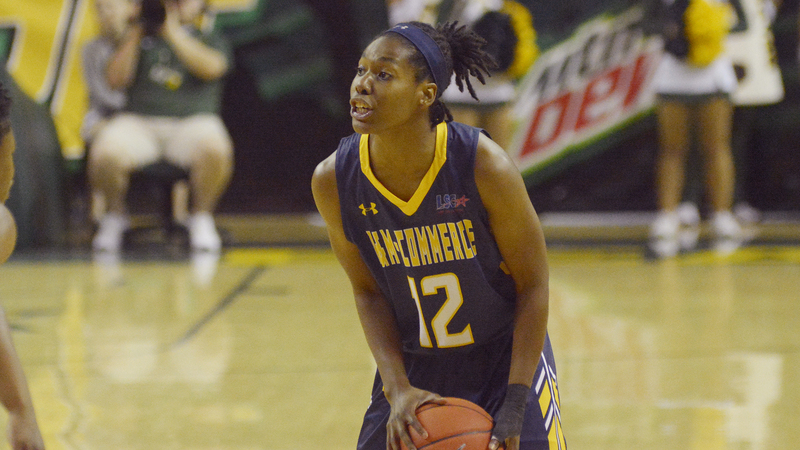 COMMERCE – The Texas A&M University-Commerce women’s basketball team saw a late lead disappear, then turned on the firepower in an 86-79 overtime win over St. Edward’s in the Field House on Friday evening. The Lions even their record at 2-2 for the year with the win, while St. Edward’s takes its first loss at 3-1. A&M-Commerce is next in action on Tuesday at 6:00 p.m., hosting St. Mary’s. – The Lions shot 43.5 percent (30-of-69) from the floor and made 5-of-16 (31.3 percent) of their three-point attempts. – Princess Davis (Shreveport, La.) became the 13th player in program history to score 1,000 career points with a basket in the second quarter. She finished the night with 16 points, six steals, four assists, and two rebounds. – Ekaterina Zhibareva (Liske, Russia) was the Lions’ top scorer with 17 points on 7-of-9 shooting, also grabbing eight rebounds. – Chania Wright (DeSoto) scored 15 points, and Mykiel Burleson (Pflugerville) notched a double-double with 13 points and 10 rebounds. Tahnia McDaniel (Euless – Trinity) rounded out five Lions in double figures with 11 points and six boards. – The Lions held a 46-33 rebounding advantage with 21 offensive rebounds. The first quarter went back-and-forth throughout, as neither side could take a two-possession lead until the Hilltoppers’ Lexi Cunningham went on a personal 5-0 run to give SEU a 16-11 lead with 2:29 left in the period. The Lions responded with a 6-0 on three Davis’ free throws and a Wright triple to regain the lead. The score was tied at 18-all after 10 minutes of action. The Lions held St. Edward’s off the scoreboard for the first three minutes of the second quarter, going on an 8-0 run. Maddison Glass (Missouri City – Hightower) capped the field with a layup to make it 26-18 with seven minutes left in half. Zhibareva’s fastbreak layup gave the Lions their largest lead of the night at 30-21, but the Toppers cut the lead to a point with an 8-0 run. Burleson hit a jumper in the paint in the final minute, and the Lions took a 36-31 lead into the dressing room at the half. As in the second quarter, the Lions roared out of the gates in the third, scoring the first eight points. Wright’s fastbreak layin after a Davis steal game A&M-Commerce a 44-31 lead with just under eight minutes remaining. SEU was able to chip away at that lead throughout the quarter, and the Lion lead stood at 56-50 entering the fourth period. The Hilltoppers were the team to start a quarter hot in the fourth, as the Lions were scoreless for the first three minutes. A pair of Burleson free throws snapped an 8-0 St. Edward’s run and the game was tied at 58-58 with 7:00 to go. A&M-Commerce went on another eight-point run, holding SEU off the board for nearly four and a half minutes. McDaniel’s jumper in the paint with 2:11 left gave the Lions a 68-62 lead. Unfortunately for the Lions, that was their last field goal in regulation, and the game went to overtime tied at 69-all. Wright’s three-point prowess powered the Lions in the extra frame. Her first triple game the Lions a 77-73 lead with 3:19 to go, and her second made it a five-point game at 82-77. The Lions limited St. Edward’s to two field goals in the final half of overtime and connected on four straight free throws to seal the win. STEPHENVILLE– The No. 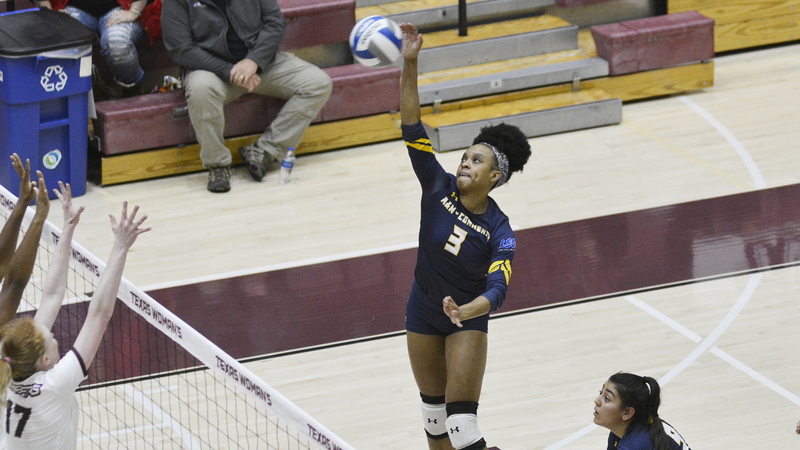 20 Texas A&M University-Commerce volleyball team defeated Colorado Mesa 3-2 on Friday night in the NCAA South Central Regional semifinal match. The Lions won the first, third and fifth sets to get the win. The set scores were 25-22, 24-26, 29-27, 19-25 and 15-12. The win brings the Lions to 30-5 on the season, and they advance to the Regional Championship match. The Mavericks fall to 24-7 and are eliminated from tournament play. It is the first 30-win season for the Lions since 1987. The Lions will play for the Regional Championship and a berth into the Elite Eight on Saturday. The Lions will face the winner of the match between tournament-host Tarleton State and Colorado School of Mines. The championship match will be played at 4 p.m. at Wisdom Gym in Stephenville. – Shelley Chapron (Houston – St. Pius X) led the team with 18 kills. She hit .300 in the match. – Bina Njikam (Keller) hit .355 with 17 kills and two blocks. Jaryn Wacker (Austin – Vista Ridge) had a double-double with 12 kills and 18 digs. – Rylie Fuentes (Robinson) had 32 assists and 13 digs while Celeste Vela (Guadalajara, Mexico) had eight kills, 26 assists, and eight digs. – Savannah Rutledge (The Woodlands – College Park) led the team with 36 digs. Riley Davidson (Commerce) had eight digs and three service aces. – The five-set match was the 12th five-set match of the season for A&M-Commerce. The Lions are 9-3 in five-set matches this season. – The Lions reached 30 wins on the season, the first time since 1987 the team has won 30 games in a season. The Lions got off to a quick start, taking five of the first six points. The Mavericks then battled back to tie the match midway through. The teams traded three-point rallies, and the set remained tied at 16. The Lions then went on a 5-1 run to take control of the game. A&M-Commerce won the set 25-22. Wacker and Chapron each had five kills in the set. Davidson led off the second set with an ace, and the Lions were rolling. They scored the first six points of the game to take a big lead. The Mavericks battled back to cut the Lion lead to three points before A&M-Commerce built their lead back to seven points. The Mavericks then fought back, tying the match at 20. The Lions won four of the next six to set up game point, but CMU took four points in a row to win the set 26-24. Njikam had five kills in the set. Wacker had consecutive kills to start the third set as the Lions took the first three points. The Mavericks rallied to tie the match at seven. The Lions took the lead back before CMU scored six of the next seven points to take a 14-11 lead. The Lions battled back to tie the match at 16. The Lions again withstood a CMU rally, which put the Mavericks ahead 20-17. After trading points, CMU held a 23-20 lead. Wacker and Chapron both recorded kills as the Lions took three in a row to tie the set again. The game went into extra points, but the Lions found a way, getting two kills in a row to take the set 29-27. Chapron had eight kills and no errors in the game. It was a back and forth battle to begin the fourth set as neither team held a lead of more than two in the early going. With the match tied at 10, CMU began to assert themselves, taking four points in a row to take a 14-10 lead. Things started to snowball against A&M-Commerce as the Mavericks took the set 25-19. Njikam had three kills in the game to lead the team. The Lions won six of the first eight points of the final set. CMU fought back, taking seven of the next eight points to build a 9-7 lead. A CMU service error swung the tide, and the Lions made four points in a row to lead 11-9. CMU cut the Lion lead to 13-12, but the Lions finished the match, winning the final two points to get the win. Njikam and Chapron both had three kills in the last set. 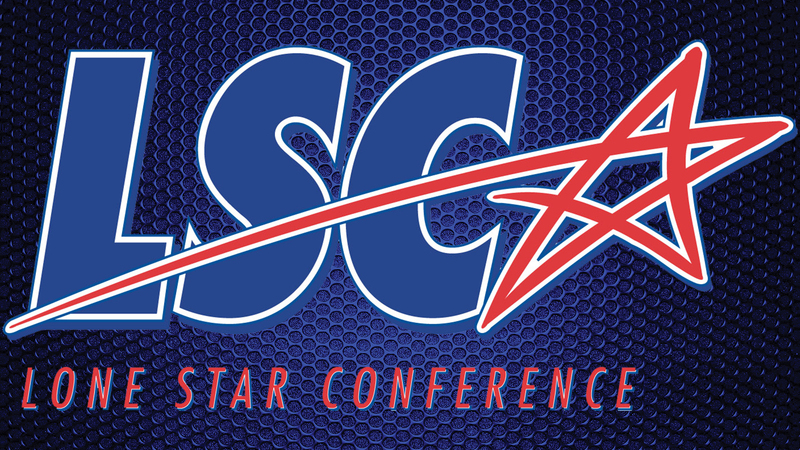 Carthel and Martinez lead the Lion honors on all of the Lone Star Conference teams. RICHARDSON – The Lone Star Conference announced its annual football awards Friday, and the Texas A&M University-Commerce Lions earned 25 recognition. Colby Carthel was named the Lone Star Conference Coach of the Year, and Kristov Martinez was named the Academic Player of the Year. The Lions were the LSC runners-up with a 7-1 conference record and a 9-2 overall record. A&M-Commerce qualified for the playoffs for the fourth consecutive season and will take on Minnesota-Duluth in the regional quarterfinal round on Saturday. Carthel wins the LSC Coach of the Year award for the first time in his six seasons as the Lions’ head coach. He is the first Lion coach to win LSC Coach of the Year since Guy Morriss in 2009. The last Lion leader before the win, the award before that, was Eddie Vowell in 1990. This is the eighth time a Lion head coach has won the award since its creation in 1962. Vowell won the award twice, and Ernest Hawkins won four times. Martinez becomes the second Lion to win Academic Player of the Year honors, following Taylor Fore in 2011. He earned All-Academic team honors for the third consecutive season and was also named first team all-LSC for the second straight year. He is a three-time all-LSC pick after earning second-team honors in 2016. Joining Martinez as first-team all-LSC honorees are offensive tackle Amon Simon (Humble – Atascocita), wide receiver Marquis Wimberly (Duarte, Calif.), return specialist Reggie Kincade (Everman), defensive end Michael Onuoha (Edmond, Okla.), inside linebacker Brucks Saathoff (San Antonio – Reagan), and safety Dominique Ramsey (Converse – Judson). Second team all-LSC honorees for the Lions are offensive tackle Malik Ellis (Daingerfield), tight end Vincent Hobbs (Mesquite – Horn), defensive tackle DD Fletcher (Arlington – Martin), outside linebacker Mark Westbrook (Schertz – Clemens), and cornerback Kader Kohou (Euless – Trinity). Earning all-LSC honorable mention are offensive guard Christian Hernandez (Frisco – Lone Star), wide receiver Ryan Stokes (St. Louis, Mo. ), quarterback Kane Wilson (New Orleans, La. ), running back Ovie Urevbu (Plano – Legacy Christian Acad. ), defensive tackle Pierre Leonard (Tyler – John Tyler), inside linebacker Garrett Blubaugh (Keller), cornerback L.A. Dawson (Austin – LBJ), punter Tristan Perry (Mineral Wells), and long snapper Drake Flores (San Antonio – Johnson). Simon earns all-LSC honors for the first time in his career. He started in every game for the Lions as a redshirt sophomore, establishing himself as one of the league’s top young talents and most dominant linemen. Wimberly earns his first all-LSC honor after catching 50 passes for 674 yards and seven touchdowns in 10 games of his senior campaign. He ranked sixth in the league in receiving yardage and third in receiving touchdowns. Kincade established himself as one of the top return threats in the nation and earns his first all-conference honor. He ranks first in the LSC and second nationally in kickoff return average at 38.7 yards per return. He has two kickoff returns for touchdowns this season. He was also previously a track All-American on the Lions’ outdoor 4×100-meter relay team. Onuoha earns first-team all-LSC honors for the second consecutive season. In his senior campaign, he has made 42 tackles with 14.0 tackles for loss, 6.5 sacks, an interception with a 48-yard return, and two blocked kicks. Saathoff earns his second consecutive first-team all-LSC recognition. He ranks fourth in Lion history in career tackles. In his senior season, he has made 85 tackles with 10.5 tackles for loss, and 2.5 sacks. Ramsey earns his first career all-conference recognition. He has made 33 tackles and been a threat in the backfield with three interceptions. Ramsey has 226 return yards, averaging 75.3 yards per interception return. This does not include an interception on a two-point conversion attempt in the A&M-Kingsville game, which the NCAA statistics policy does not count as an interception. Ramsey’s interception return yardage leads the nation. Ellis showed his dominance at tackle for his third season as a Lion and earned his second career all-LSC honor. He was an honorable mention to the conference teams in 2016. Hobbs battled through injuries in his senior season to earn all-conference honors for the second time in his career after earning first team honors as a junior. In 2018, he has 25 receptions for 247 yards and four touchdowns. Fletcher earns second-team all-LSC honors for the second straight season. He has made 37 tackles with 7.5 tackles for loss and 1.5 sacks this season. Westbrook earns his first career all-conference honor as the Lions’ second-leading tackler. He has made 57 tackles with a career-high 12 tackles against Tarleton. Kohou earns his first all-conference honor after ranking fourth in the conference in passes defended with an interception and 11 pass breakups. He returned his interception for a touchdown at Western New Mexico. He also leads the conference and ranks fourth nationally in forced fumbles. He has 33 tackles with 3.5 tackles for loss. Blubaugh was also named to the All-Academic team for the second season in addition to his honorable mention. Nick Pelrean Texas A&M-Kingsville RB Sr.